For two groups of students in the Jenkins MBA and Master of Global Luxury Management programs, spring break wasn’t just about relaxing on a beach or relaxing with friends. MGIM students at SKEMA, NC State’s sister campus in Sofia-Antipolis, France, conducted their field research on luxury markets, then learned about methods researchers use to identify emerging trends. Students in the Jenkins MBA program International Trendspotting course took their knowledge out into London, immersing themselves in the spaces where trends in culture and design are born. Dr. Colbey Reid, director of the Consumer Innovation Consortium at the Poole College of Management, taught both groups of students how researchers use knowledge gained in the field to inform future decisions. “Identifying a trend before it is ‘cool’ is far more difficult than it sounds,” said first-year MBA student Dave Knospe. “However, Dr. Reid taught us a number of research methodologies and took us to areas of London that you can’t find in a guidebook to spot trends at their epicenter – street culture. By getting us out of our comfort zone and urging the group to approach our research impersonally and empathetically, Dr. Reid provided us with a skillset and experience that won’t soon be forgotten.”. Thanks to the enthusiasm and engagement of the terrific students enrolled in these programs, both study abroad courses were a great success. There were 45 students in the MGIM class, and we were able to spend an afternoon discussing trends they’d identified one-on-one. The projects that students are researching in that course concern topics ranging from new developments in the super yacht industry to “pastry couture” and the emerging architectures of luxury entertainment. As the students had already spent their spring break traveling abroad the week before, our time together took place in the classroom as we reviewed key trendspotting concepts for the luxury market, including relevant brand and product aesthetics and the effects of luxury consumption. We also examined methodological protocols for multiple qualitative research techniques that would help the students gather data about their discoveries and make the case for their relevance to global luxury markets. The second course took place in London, and focused on trendspotting for culture and design. This curse entwines traditional classroom lectures and discussions with extended field work. In particular, students spent time examining urban spaces for trend emergence, the movement of trends from “street to catwalk” and the transition of trends between categories – such as clothing to technology or food, public marketplace to brick and mortar retail, retail to entertainment (and vice-versa). London is an industry-recognized center of trend emergence, in part for its extraordinary multiculturalism … So, we also studied spaces of multicultural emergence and contact – London’s thriving market scene is a great place for this – and learned how to determine when and how products and services indigenous to one culture can be imported to another. Tapas are a great example of how marketers have successfully turned one culture’s traditional food consumption practice into a hot American trend in the past – but not before making several crucial changes to fit the Spanish practice more neatly into American food and dining behavior codes. 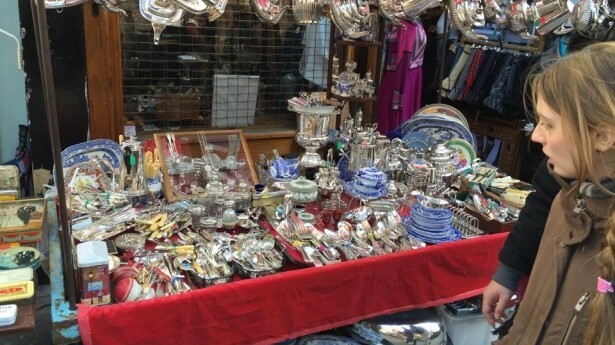 We studied the subtle but important contrast between the antiques markets on Goldborne Road (hot) and Portobello Road (not). We visited the self-described “entrepreneurial incubator” of emerging designers and international cuisines at the Sunday UP Market and Back Yard Market in the Old Truman Brewery in Shoreditch, one of East London’s most exciting neighborhoods for trends in these categories. We also took a private tour of the Victorian and Albert Museum of Design, focusing on the history of trend movement from innovative street spaces like markets, clubs, and public museums to high cultural spaces like fashion catwalks, luxury markets and aristocratic courts. For an investigation of one of the great trends in the art market with far broader implications – and a lesson in the importance of sustainable trendspotting – a street art bike tour of the East End exposed students to the ironies and implications of business development in one of the city’s historically most impoverished neighborhoods. Our examination of London’s latest entertainment trend, the craze for immersion theater, took us to a performance of “Grimm Tales,” Philip Pullman’s revisionist fairy tales, in a converted barge house by the Thames where audiences – not actors – moved from set to set. Two landmark events took place in London during our visit, and everyone in the class was able to attend at least one of them. We all went to the Wearable Technology Expo in the London Docklands, and saw that the Jawbones and Fitbits of the future include computer networks woven on the loom, right into shirt, glove, sock and sports-bra textiles! At FutureFest, we witnessed an orchestral performance offered to blinded audience members and augmented by choreographed human touch; Neurosis, an amusement park ride powered by human brain waves; medicinal cocktails distilled in nutritionists’ laboratories; and the Internet of touch, smell and taste as designed by Professor Adrian Cheok’s mixed reality lab at the City University in London. Think of a machine into which you insert your tongue for the direct stimulation of tastebuds, a “hugging jumper” or device for producing digitally transmitted kisses, and an accessory you can plug into your cell phone so that it emits scents. Sound impossible? These all exist, already. Trendspotting shows students that the world of our future doesn’t materialize out of nowhere. Its traces are already visible in our present, if we know where to look for them. Looking out for the things that avant-garde individuals and cultures are doing to push the boundaries of what already exists allows students to get a leg up on innovation and risk management. It also makes them keenly attentive to consumer inventiveness and preferences. This has implications for market intelligence and analysis, of course, but also new product design.